An electrocardiogram (EKG) is a test that checks for problems with the electrical activity of your heart. 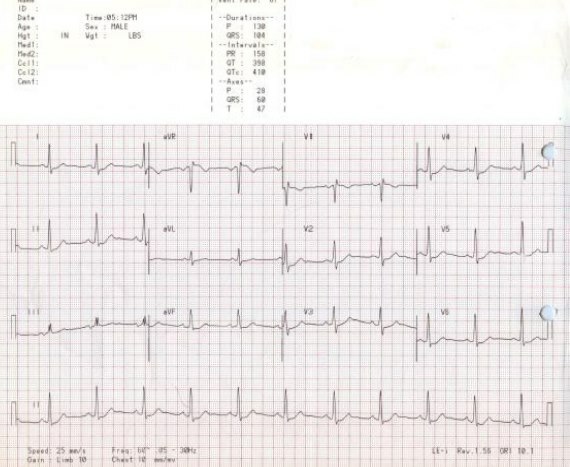 An EKG translates the heart's electrical activity into line tracings on paper. The spikes and dips in the line tracings are called waves. The heart is a muscular pump made up of four chambers. The two upper chambers are called atria, and the two lower chambers are called ventricles. A natural electrical system causes the heart muscle to contract and pump blood through the heart to the lungs and the rest of the body.